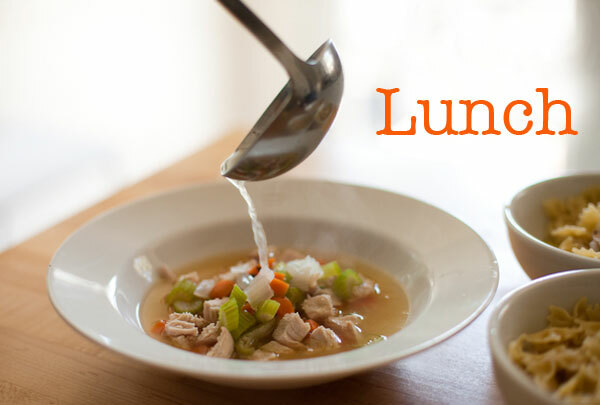 This is the ultimate Lean Luxury meets Comfort Food – Chicken Soup – Lean Fix by Tom Colicchio from Made in America. It’s one of my favorite recipes from MADE IN AMERICA to cook for the family – I make it at least twice a month – and more like once a week, with the sniffles we have all had to varying degrees recently. It’s also super easy to prepare, extremely satisfying and I can adapt it to keep it light – it’s a natural LEAN FIX! The kids can’t get enough of this soup. I have made it so many times now that it’s changed a little from the original recipe that Colicchio gave me for MADE IN AMERICA but the essence of the original recipe remains the same. 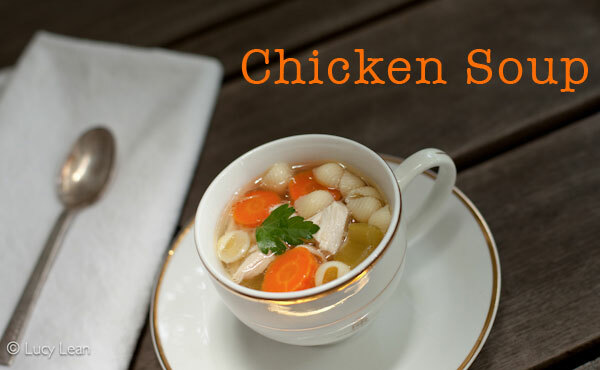 People have turned to chicken soup as a cold remedy for centuries around the world. Dubbed “Jewish Penicillin,” chicken soup was even given as a prescription in England, and the Chinese also believe it helps to restore health. Recently science is catching up to tradition, and studies show that the soup does indeed have anti-inflammatory properties and thins mucus, plus the steam helps to decongest, the vegetables contain lots of healthy nutrients and the light broth is easy to digest. In medieval times in Europe the soup was eaten separately from the chicken – which is how Colicchio suggests serving his dish. Across the world starch has been added to the soup; rice noodles, pasta, potatoes or dumplings can all be served with it. Colicchio’s chicken soup is bursting with flavor and restorative, perfect if you are in need of a boost reaching for tissues. “The hardest part of the recipe is the cutting of the chicken. I like to start the chicken in the water and cook for forty minutes before I add the vegetables and then I add the pasta shells at the end,” he says. Once you’ve tried this simple and straightforward recipe, I’m certain you’ll never go back to canned or boxed soup again. I don’t bother quartering the chicken – I place the whole bird into the pot and then pick off/carve the meat when it’s cooked (it’s usually falling off the bone). This cuts out the hardest part of Tom’s recipe. The family all have large helpings of pasta in their soup whilst I usually eat it without. 2 parsnips, peeled and halved. 1. Rinse the chicken under cold running water and place in a large stockpot with enough water to cover it, about 1 gallon. Over low heat simmer gently, skimming regularly for 30 minutes. 2. Add the chicken stock, carrots, celery, leeks, parsnips, onion and fresh herbs. Season with salt and black pepper. Simmer for a further 20 – 30 minutes. 3. Meanwhile, over high heat bring a large pot of salted water to the boil. Add the pasta and cook until al dente. Drain, return to the pot, add ½ cup of the broth from the soup and cover until ready to serve. 4. Divide the pasta into 3 of the 4 bowls, no pasta for those keeping it carb-lite. Remove the chicken from the pot and either serve alongside the soup as Colicchio suggests or pull off pieces of chicken and add to the bowls. Remove some of the vegetables, slice and divide between the bowls. 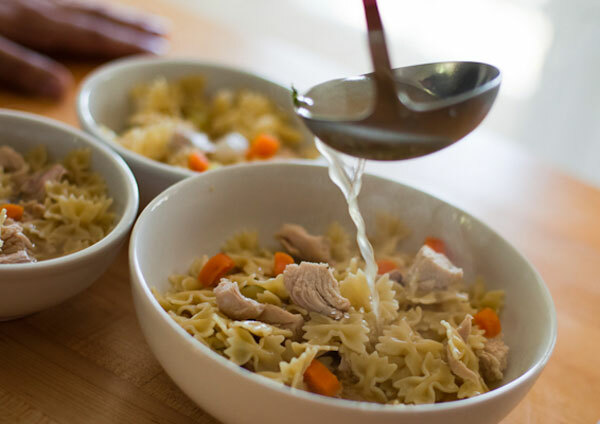 Finally, ladle the hot chicken soup into each bowl and serve immediately with the grated Parmigiano-Reggiano and a drizzle of extra-virgin olive oil. I’ve been on the hunt for a stellar chicken soup recipe. I am definitely bookmarking this! Thanks Lucy. Very similar recipe to my dad’s version – and i love it – i usually make this every other week to have around. Has your daughter arrived? Been thinking of you and names… Minty/Araminta now wants to be a boy! And be called Aramis! I’ve been needing a little variation for my chicken soup, so I’ll give this one a try. 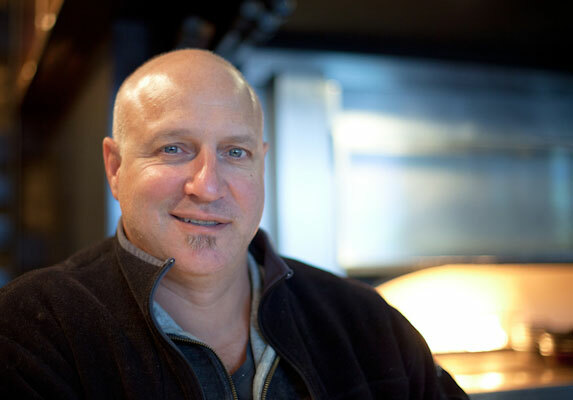 Great photo of Tom Colicchio. Did you take that? Yes – it was tricky to get him to agree to letting me take his photo but I’m glad I did. poor you – get well soon – and this really will help!